The Significance of "al-Asmaa ul-Husnaa"
Du'aa (supplication) is the voice of the sorrows and pains of the heart. No matter, whether a man is in sorrow or happiness, his feelings and thoughts find their way out through his speech, which is du'aa. Allaah Ta'aala says in the Qur'an, ‘Perform du'aa in my way and I will acknowledge it.' Allaah is very close to the one who supplicates and He answers to it. It is accounted from Ahl ul-Bayt (AS) that, if a mumin wishes to perform du'aa in the way of Allaah for him then he should ask for the things which are permissible. He should not ask for things like ill-health, poverty, tyranny or break of relations for others. It is mandatory upon him to do virtuous deeds before supplicating; he should seek pardon for the sins he has committed; and he should ask for peace and harmony with other mumineen if he has severed his relations with them; and he should make candid intentions for his deeds. It is narrated from Hazrat Abu Zarr (RA) that, ‘Righteous actions gives sufficiency and completeness to du'aa just as salt gives to food.' A mumin in his du'aa should first praise Allaah in His supremacy, then he should seek benediction on Rasoolullaah (SAWS) and his progeny followed by du'aa. 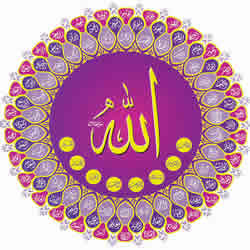 Allaah (66), Rabb (202), Rahmaan (299), Raheem (258), Maalik (91). Moheet (67), Qadeer (314), ‘Aleem (150), Hakeem (78), Tawwaab (409), Baseer (302), Waase' (137), Badee' (86), Samee' (180), Kaafi (111), ‘Aalim (141), Raoof (287), Shaakir (521), Ilaah (37), Waahid (19), Ghafoor (1286), Haleem (88), Qaabiz (903), Baasit (72), Hayy (18), Qayyoom (156), ‘Ali (110), ‘Azeem (1020), Wali (46), Ghani (1060), Hameed (62). Wahhaab (14), Qaa'im (142), Saree'ul-Hesaab (442), Khabeer (812). Raqeeb (312), Haseeb (80), Shaheed (319), 'Afwa (156), Moqeet (550), Wakeel (66). Faatir (290), Qaahir (306), Qaadir (305), Lateef (129), Haakim (69). Ne'mal Maula (268), Ne'man Naseer (541). Hafeez (998), Qareeb (312), Mojeeb (55), Qawee (116), Majeed (57), Wadood (20), Fa''aal (181). Mannaan (141), Khallaaq (731), Saadiq (195), Kareem (270), Haadi (20), Fattaah (489), Barr (202), Muqtadir (744). Haqq (108), Mubeen (102), Noor (256). Ghaafir or Ghaffaar (1281), Qaabil (133), Shadeed (318), Zut-taul (782). Razzaaq (308), Zul-Quwwat (840), Mateen (500). Baaqi (113), Zul-jalaal (801), Zul-ikraam (999). Awwal (37), Aakhir (802), Zaahir (1106), Baatin (62). Quddoos (170), Salaam (131), Mumin (137), Mohaymin (145), ‘Azeez (94), Jabbaar (206), Motakabbir (662), Khaaliq (731), Baari (214), Mosawwir (336). Supplication done along with these names is acknowledged and accepted. If we seek anything from Allaah with these names then verily it is granted. If a mumin recognizes the blessings of acceptance of his supplication then he performs it with faith and clean heart. For the accomplishment of the wishes of his ummat, Rasoolullaah (SAWS) has granted the tasbeeh of Maulaatana Faatema (AS). This tasbeeh has 100 beads with the words of Al-hamdolillaah (33 times), Subhaanallaah (33 times), Allaaho Akbar (33 times) and Laa ilaaha illallaah (once). These 100 beads represent and signify the succession of 100 Imaams (AS) from the progeny of Maulaatana Faatema (AS). The numbers given in the brackets besides the names of Allaah given above indicate the alphabetical calculation of each name of Allaah. There are 28 alphabets in Arabic language. You have to calculate the numerical value of your name by adding up the individual values of each alphabet of your name. After doing this, you have to match the numerical value of your name with the values of the names of Allaah. You may select any number of names of Allaah to match with numerical value of your name. Example 1: Your name is Mohammad which has four alphabets; meem (40), haa (8), meem (40), daal (4). After adding up the values of these alphabets, you get the figure of ‘92'. Now you have to look up in the list of names of Allaah and find out whether any name has this value of ‘92'. If there is no single name matching with the figure ‘92' then you have to take any two or three names of Allaah to get ‘92'. Here, there is no single name which has the value of ‘92'. So you take two names; Hakeem (78) and Wahhaab (14). The value of these names added together is 92. You have to do the tasbeeh of these two names Yaa Hakeemo and Yaa Wahhaabo. Example 2: Your name is Zainab; zaa (7), yaa (10), noon (50) and baa (2). The value is '69'. Looking in the names of Allaah we find Haakim (69). You have to do the tasbeeh of Yaa Haakemo. Example 3: Your name is Haatim; haa (8) + alif (1) + taa (400) + meem (40) = 449. Looking in the names of Allaah we find that the value of Tawwaab (409), Wadood (20) and Haadi (20) is '449'. You have to do the tasbeeh of these names. If you do the tasbeeh of these selected names of Allaah which is equal to the value of your name then Allaah will give intellectual, physical and spiritual powers to you and this action is helpful in any of your difficulties. Note: Mumineen are requested to enquire about the meaning of any of the names given in the list before naming their babies. To enquire please email : masaail@alavibohra.org.